reiteration on "war against muslims @ kadawatha ?" I came across a post called War Against Muslims @ Kadawatha? by themissingsandwich , probably on the same day i came across an email about the incident. I am posting it below. In Ramazan this year, some Muslims started a thakkiya (small mosque) on Kadawatha Road , Dehiwela and were conducting tharaweeh prayers. The mosque was operating on a very low key and causing no hindrance to anyone. However some Sinhalese villagers banded together, along with a few monks who then sent a delegation to this mosque demanding them to stop conducting prayers. The activities of the mosque were stopped overnight. 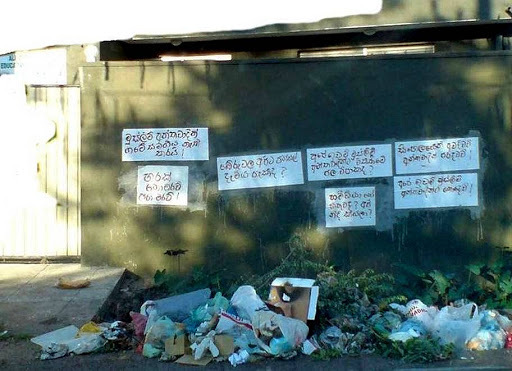 Some Sinhalese villagers had already started intimidating Muslims in the area and dumping garbage right in front of the building in question. Around February 23rd 2008, this building was reopened as “The All Ceylon Muslim Educational Conference” but some Sinhalese villagers banded under the leadership of some extremist monks, hung black flags in the vicinity and defaced the walls of the building with racist posters. A fresh pile of trash was also dumped just outside the parapet wall and some garbage thrown in over the wall as well.An adhoc meeting was arranged adjacent to the mosque and presided by monks, where it is alleged that many racial statements were issued. Some Sinhalese villagers then kept overnight vigil by assembling at closeby Sinhalese houses and drinking through the night and singing and revelling. The police had posted two officers at the point to watch out for any mishaps, but a confrontation has been avoided largely due to the non-violent behaviour of the Muslims in the face of open aggression by some uneducated Sinhalese. What the Sinhalese are doing is entirely illegal, unethical and unjustifiable even under their own standards. However there seems to be a general acceptance of violating the rights of minorities in the current political backdrop. If we as Muslims (or as responsible citizens of Sri Lanka – be it Buddhist, Hindu, Catholic, Muslim) and the relevant politicians/authorities do not take any action, this incident can be taken as another step in oppressing our fundemental right to practice our religion and further violation of our rights to do what we want (legal things) in our legally owned buildings. The saddest part of this story is that the authorities are treating this incident as a nuisance rather than a violation of fundemental rights and their main aim is to “keep peace” rather than ensuring justice. The photo attached was shot on the morning of the 25th Feb 2008 and shows the defaced walls and the garbage dumped by some villagers. Below are the translations of the posters seen in this photo…. 1. Muslim extremists jeopardize the unity of the village!!! 2. Don’t slaughter cattle!! slaughter PIG!! 3. Can we open temples in Beruwela? 4. Is this the result of selling our property to Muslim extremism? 5. Hameedias! do you think that we are sleeping? 6. Wake up Sinhalese!! humiliate the extremists!!! 7. Don’t give our property to Muslim extremists!! !